Alia Bhatt wore it better than Kangana Ranaut, say fans! Home Alia Bhatt bollyfmblog Kangna Ranaut Whats New Alia Bhatt wore it better than Kangana Ranaut, say fans! Alia Bhatt and Kangana Ranaut have very different sensibilities when it comes to style so it is not often that we get to ask you, who wore an outfit better. But recently the two divas presented us with an opportunity by wearing the same A.W.A.K.E. dress. While Alia was seen wearing the dress for a magazine photo shoot recently, Kangana wore the spunky number for Katti Batti promotions in Dubai a few days back. 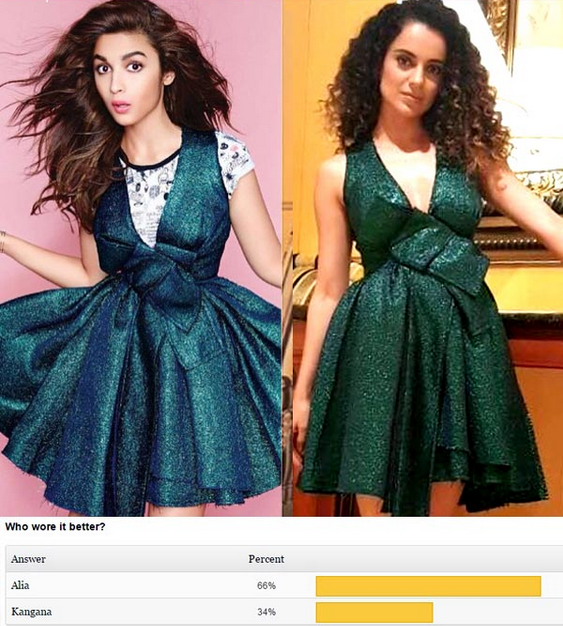 Fans suggest that Alia wore the dress better than Kangana did. Alia bagged 66 percent of the total votes and defeated the Katti Batti actress by a sweeping margin, who only received 34 percent of the votes! Even though they were wearing the same dress both Alia and Kangana put their own individual twists to the dress and made it their own. Alia covered the plunging neckline by wearing the dress with a t-shirt. She teamed it with blue Louboutin pumps. Kangana on the other hand wore the dress like a queen, flaunting her cleavage in the daring neckline and rounded off the look with black pumps.